One of my favorite television shows has returned! 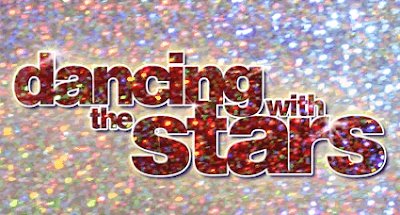 I had the biggest smile on my face when I sat down to watch the first episode of Dancing With the Stars on Monday night. Not only do I love the dancing, the music is awesome, too. I got lots of knitting done the last two evenings as I watched both of the two-hour episodes. I'm rooting for Donny Osmond right now. Ever since I heard him sing on the soundtrack to Joseph and the Amazing Technicolor Coat I've been a big fan, plus I have fond memories of watching the Donny & Marie show as a kid. But Kelly Osbourne looked great last night, too, surprising everyone with her elegant dance moves. It would be fun if she took home the trophy. This weekend is an event I look forward to all year, the Peninsula to Pier Yarn Shop Hop. For three days you visit local yarn shops from San Mateo to Carmel (about 100 miles), getting your passport stamped at each one. The shops offer a special ball of yarn for sale along with a free pattern to knit a square that can be used for an afghan. If you get a stamp from every yarn store, you are eligible to win a $400 gift certificate at your favorite shop. The shops buzz with energy and excitement during this event, and my enthusiasm for knitting is renewed. Sadly, many of our local yarn shops went out of business over the last year, but there are still a dozen or so involved in the hop. I'm going with a knitty friend and can't wait! In a couple weeks Dogwood and I are going on an afternoon boating excursion at Elkhorn Slough in Moss Landing. A naturalist will be on board to talk about the birds and marine life-- the slough is rich with otters, sea lions, harbor seals, pelicans, and more. I've gone kayaking there a few times and it was absolutely wonderful. This is the pontoon boat we will ride on. It's nice and stable, and the water is calm, thank goodness. Dogwood and I both get seasick, so I had to confirm with the tour operator that there wouldn't be rough water. I think it will be educational and fun, plus I just love being out on (calm) water. There are lots of whale watching tours around here, but I haven't been on one in years because of the seasick factor. Next year I plan to do more kayaking in the slough-- one of my goals is to spend more time outdoors, being active. Happy Wednesday to you ... hope you are having a great week. Fun, fun post! Maybe I need to start watching Dancing with the Stars. It sure is getting the "buzz" right now by so many people. The Yarn Sox Hop (cleaver name) sounds like lots of fun!!! 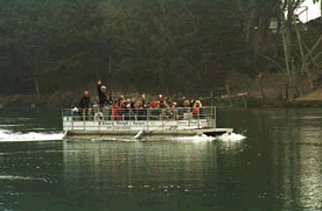 And, Oh boy...we are going to have so much fun "calmly floating" aound in the pontoon boat in the slough learning about birds and marine life! I am soooo EXCITED about this adventure. The great outdoors is a fabulous place to be! Hi stacy,over here we have 'Strictly come Dancing' which has just started with the first two episodes being two hours i think, while over on the other channel is 'X Factor' now i know which one i prefer but there is a bit of a debate going on because they are showing them both at the same time and alot of people like to watch both!!! I LOVE Dancing with the Stars. I thought Kelly Osbourne did great last night too, everyone was so surprised. I really enjoy that show. I hope you and Dogwood enjoy your adventure! Have a blessed evening! I watched DWTS for the first time last night...can't resist Donny Osmond! I still have my Donny & Marie dolls from the 70's, and saw him in "Joseph..." a few years ago in Boston...incredible performer he is!! Have a great time on your upcoming adventures!! I've never watched Dancing with the Stars - never! I know Cheryl loves it, though. She says it's so elegant. Maybe someday I will sit down and knit in front of the t.v. (but I always make mistakes when I do that). Have a wonderful time on your knitty tour. 100 miles of yarn shops - Wow! It sounds like you have lots to look forward to in the next few weeks. It's important to have things to look forward to! What fun! A yarn shop hop! I did the CT quilt shop hop and it was really fun! Can't wait to hit it again... hopefully they will have another next year. Wow -- I didn't realize that yarn shops did shop hops like the quilt shops do -- it's a great idea. I hope you have a great time! We are happy too! We watch Dancing with the Stars together. Thank you for the congrats!!! I am so happy! I'd love to be able to dance, but can't find a dance partner. We have a similar show called Strictly Come Dancing. It is sooo popular and huge hype about it here. There are so many stars that appear. I love the idea of the yarn shop hop wow, so exciting and such fun. I'd be so in your gang for that one! Your trip with Dogwood sounds so lovely. What a great thing to look forward too. I think it is important to always have something to look forward to. It keeps us happy. I HOPE that you win the 400.00 to shop with !!! Thanks for your support during the Mom thing :) I so appreciate it. Thanks also for doing the flicker...I need to go see it. Have a Great weekend. Sorry I haven't been around much...hoping for calmer days. What a great blog! I love Dancing with the Stars, too. Donny is my favorite. Your yarn shopping sounds like it was a lot of fun!